On February 1, 1814, the Mayon Volcano had its most violent eruption in recorded history, destroying the entire town of Cagsawa. Over a thousand people were killed in the disaster, including hundreds who sought refuge in the stone church during the eruption, but were tragically engulfed by the fast-flowing volcanic matter. 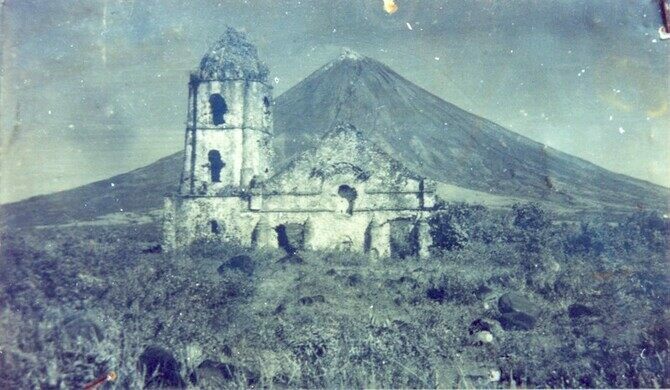 The belfry and parts of the facade are all that remained of the 16th-century Cagsawa church after the eruption, but the facade collapsed over time, leaving only the old bell tower standing today. It is now joined by a wooden cross that was placed where the church altar used to be. Today, the Cagsawa ruins are one of the most popular tourist attractions in Albay province, as they are set against the magnificent backdrop of their very maker, the Mayon Volcano. Equal parts historic and scenic, the site, now named Cagsawa Ruins Park, was even declared a national cultural treasure. Cagsawa Ruins Park is located just outside the city of Daraga in Albay Province. As a popular attraction, the site has plenty of food, souvenirs, and activities, such as ATVs rides that take visitors closer to the volcano. The park is near the Cagsawa National Museum, a branch of the of the National Museum of the Philippines.